Huliganov’s Barcelona Experience #6 – Hasta la Vista, Barcy! Some well known streets in Barcelona are covered in this video, which has a sizeable montage of gallery shots to music towards the end reflecting the fantastic atmosphere we witnesses in this city. If a restaurant has been good, I like to go there again. So, more great live music and food shots, as well as a visit to the celebrated Koska shop, the home of Turkish Delight! Nice to see the same faces and hear the music and taste the food. I hope to go there again one day. I wonder if the same guys will be there. We’re looking at the way architecture in Barcelona is a fusion of older and more modern elements. Maybe not exactly ancient, but quite older stuff next to things from more recent decades. Assuming for the sake of argument, that “the world” was created, and life too, *how many years ago* do you think that the first life on Earth was created? And do you think our species was created in a “biological continuum” or did it require its own origin-of-life event? If the latter, how many years ago was it? I personally think that human kind has been around for 70 generations before Christ and is now coming up to 70 generations after Christ, at which point it will end. I think this is a version of events with about one adherent at the present time. I think that in the Scripture it gives 14 generations from Christ to the captivity, 14 from the captivity back to David and 14 from David back to Abraham. This then stops, but shows the existience of a certain pattern which we can follow. It must be there for a reason. 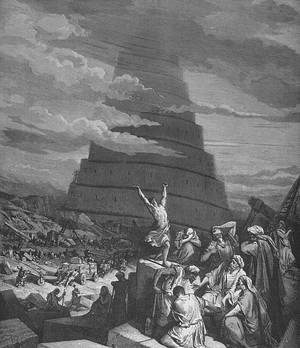 I discovered that working forwards from the beginning of Genesis there are 14 generations to Peleg, which name infers the division of the world, a reference I believe to the Babel event. The scripture does not hold, or claim to hold, a complete reference to all generations between Peleg and Abraham, and this is natural as there was no normal language at that time, so there are about 5 generations which have lost information – a very interesting period of earth’s history, by the way, about which there are probably more unanswered questions than any other – we have basically things like funnel beakers and cave paintings and that to go on. Basically this means that Ussher probably assumed too literally that the generations between Peleg and Abraham were fully recorded in Genesis, but there simply isn’t enough time to get from a Babel scenario to the world as described in the time of Abraham in that space of tgime. In addition for this space of time there are divergent chronologoes in Chronicles and in Genesis, which for those who believe in inerrancy of Scripture ought to be a clue that the Bible is telling us that in that area it is not trying to give us a complete account. 14 generations between Adam and Peleg, 14 between Peleg and Abraham, 14 between Abraham and David, 14 between David and the captivity, and 14 between the Captivity and Christ. That’s seventy generations. That’s a perfect number. And because Christ is the central figure of history, he comes in the middle of the generations. The generation length, which I personally define as the age of a woman at the birth of her median surviving female child, can be placed at about 30 years. This means that 70 generations take around 2100 years. We live in the time where the 70th generation is being born, one of whom will be Antichrist, and maybe already is, and we also live in a time where the Gospel has been taken to every tribe, where the Jews have returned to Israel and where there is continual threat of war around Israel. We live in a time where we are being faced with monetary and political union and control to an unprecedented degree, and where the falling away from true religion has also been unprecedented. In short, almost all the prophecies that needed to be fulfilled before the Return of Christ in glory, and the garnering up and resurrection of those who accepted him in faith, be they alive or dead. The close of this creation and the unveiling of the new Creation outside of the restraints of the particular physical laws that have governed this one. We cannot die or suffer in it, we will know God and find bliss. We shall sing and fly like angels, dive like orcas and find wonder and beauty in every everlasting corner of it. However the generations before Christ were not always 30 years. The chronologies show that before the Flood the aging process was much slower. It is possible that oxygen levels were lower and the free radicals responsible for aging less prominent – even now longevity is more seen in mountain populations as in the Caucuses, where oxygen is more scarce. The release of the waters and the process of their assuaging clearly changed the amount of oxygen available in the atmosphere. If you separate out hydrogen and oxygen as gases, instead of water vapour, then the hydrogen will wander off into space as it cannot be held by gravity. Hence during the assuaging of the Flood the amount of atmospheric oxygen increased strongly. The first generations were therefore longer. The median child of a woman could have been hundreds of years. This means that we cannot say that these 70 generations lived only over 2100 years. They may have lived over 4900 years, which is the figure I get if I assume about 300 year generations until Noah’s generation (9th), and then that tapering down to Peleg’s. That gives 4900 BC and 2100 AD years for a total of 7000 years of creation. So I think that life was created some 6900 years ago. Put in place looking mature and pre-existant, with Adam even having a navel, although he had no mother, and with radioactive isotopes in igneous rocks already partly decayed. This was no deception by God, as Adam knew perfectly well where he came from and always was able to hand down those facts through his generations, as did many people in the time when God communed more freely with man, but it was there to enable mankind in the latter generations (where overwhelmingly most of the human souls occur – especially in the last few generations in the modern era post Darwinism) to find an alternative to believe if they rejected God. It was made that way precisely so that we can believe whatever we choose. It was made that way precisely so that millions of human beings like you and me can have this debate, whether with each other or in the privacy of their own minds, and that some might be drawn to believe still in their creator and their redeemer, even when the world is dragging them to interpret the things God made in an atheist way, and that in the exercise of faith they may be separated ought, have their imperfections and iniquities forgiven and restored, and come to a knowledge of God in love and be enabled to join with him in a relationship of children to a father. That’s what it’s all about. Be part of it. Believe, and be part of reality.